The RT-40 is a powerhouse in a small package. At just 4-ft. wide, it comes with a turbocharged Kubota diesel and tops out at over 7 miles per hour. 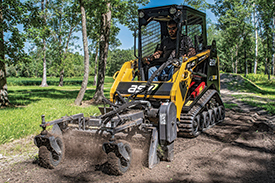 This machine produces 84.5 foot-pounds of torque, and with ASV’s Posi-Power system, it provides high tractive effort for superior pushing and digging power. Tack on the low 3.5 psi ground pressure and the RT-40 is the ideal combination of size, power and precision every landscaper needs.